A “Shiromuku” with fine embroidery motives with silver yarns on the 100% pure silk. It’s modest and graceful, but has a strong appeal. This “Shiromuku” can be worn with “CHODO” plan. 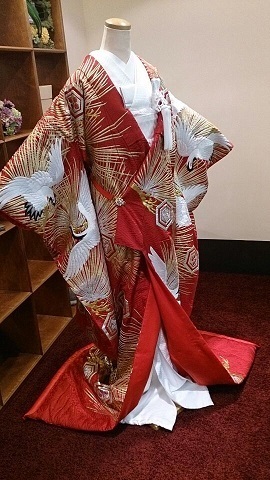 An “Irouchikake” with gorgeous crane and chrysanthemum motives on red color base. 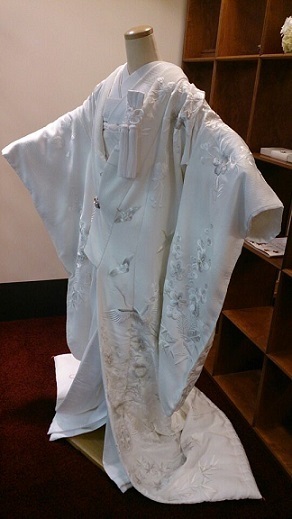 The lame yarns used in the base fabric made the kimono more impressive. The display in Tokyo branch has been renewed. Whenever I talked to her, I could feel her passion for the costumes and affection for the brides and grooms who are going to wear them. I always learn a lot from her attitude. The new display at the entrance changed a impression of the entire salon. I realized again that bride and groom’s changing their costume and hairstyle during the wedding reception can surely change the atmosphere of the reception and made it more radiant.